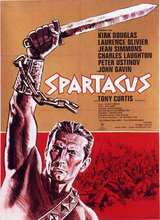 The slave Spartacus is sold into a gladiatorial school, and after participating in a match to the death for the amusement of patrician Romans, revolts with the other gladiators; they and other slaves make a formidable army which nearly topples the Roman Republic in 73 BC. The film was originally to be directed by Anthony Mann, but Kirk Douglas fired him three weeks into production. Won Oscars for Best Actor, Best Cinematography, Best Set Decoration and Best Costume Design; received additional nominations for Best Dramatic Score and Best Editing. A 1991 restoration has the "snails and oysters" scene included.